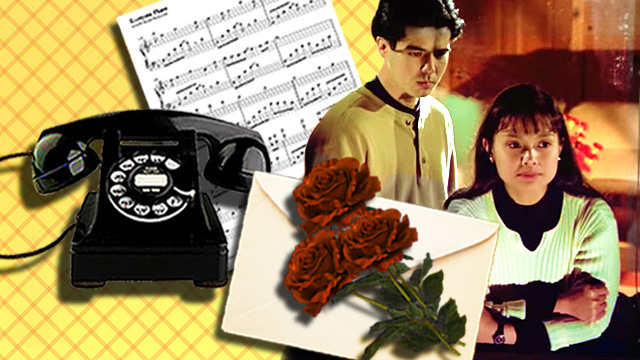 Paying tribute to a time when relationships were less complicated. Dating in the '90s was simpler. The status of your relationship wasn't based on a Facebook option. Communicating with your special someone doesn't mean you'd have to be constantly on the lookout for Viber messages. Plus, you actually have to talk to the person to get to know her deeper. Few things were better than receiving a letter from your girlfriend at the end of a long day at school. Who here have kept their love letters, all these years? At times, you had to stretch the cord to get away from your evil sibs who love to tease you. Personally. Not through an in-depth analysis of her "About Me" section on Facebook. Back then, parents had an easier time keeping track of their daughter's movements. The absence of a do-everything smartphone assured that. So, part of wooing a girl involved wooing the parents too. It was difficult but nothing can be more fulfilling than getting the approval of the parents. It’s like playing a game and getting a level unlocked. Remember those days when we make suyo our baes from the'90s by requesting a song for her over the radio? And it really worked! So much better than SMS rejections! The person is right in front of you, so there's a chance to talk, ask what went wrong and maybe fix the relationship. Fights aren't posted on the network for everyone to know. Zero chance of her freaking out if she sees on her newsfeed that you've liked somebody else's photo. And most of all, you don't have to worry about getting unfriended or blocked when things are getting shaky.